Decorating your bedroom can be challenging. I have decorated and redecorated my bedroom a ridiculous number of times over the past four years. I don’t know what it is about this space that has caused me so much indecision, but I just never felt like I could get it quite right…until today! 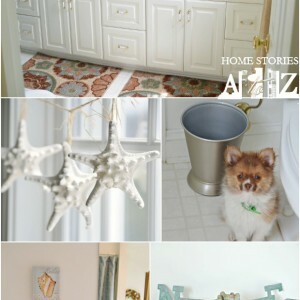 Thanks to Layla and Kirklands.com I think I have finally figured out this decorating your bedroom business! Below you can see a few of the looks my bedroom has “donned” over the years (and you can also see how much my photography skills have improved). Several months ago, I reached out to Layla for some “presto chango” help on my bedroom. I told her I wanted to incorporate coral into the room and here is what she came up with for me! I was particularly inspired by this picture that she used to determine the color palette. I’m still in search of a similar throw! I think my room needs that throw, but I have yet to find it. If you spot one while shopping, let me know! With the inspiration from Layla and Kirland’s furniture and accessories, I now have a bedroom I adore! Did you know that you can shop online at Kirkland’s? I had no idea! They actually carry some items online not found in the stores. Smaller items can be shipped to your home and all furniture items will be shipped to your nearest store location for pickup. Sweet! 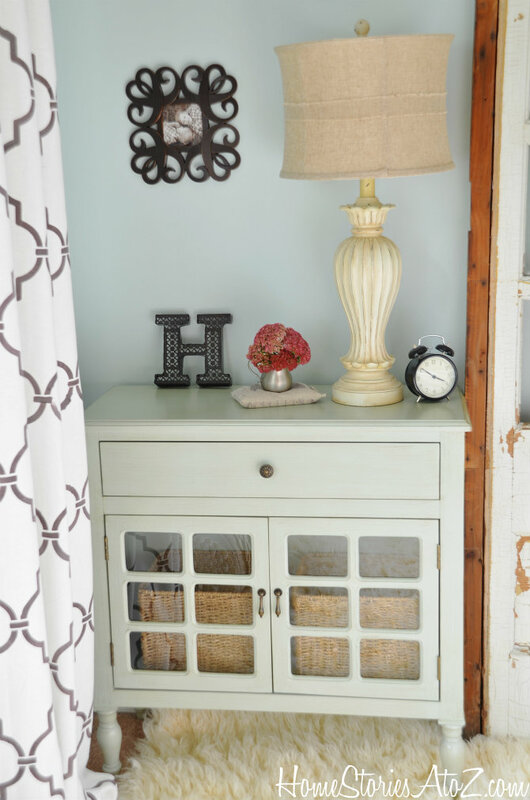 I picked out these beautiful lamps with burlap shades from our local store and ordered the cabinets online. The online stock goes FAST so if you see something you like order it. Don’t hesitate. I had originally wanted these mercury glass lamps, but by the time I decided to order they were completely sold out. My local store was also sold out of the lamps, so I was out of luck. Fortunately, Kirkland’s has a wide variety of lamps to choose from, so I was easily able to find some others that I liked. My Seafoam Green Storage Bench is still for sale online as I type this :). It has a hinged lid and is fabulous for storage. My cabinets are currently sold out online. I am so glad I ordered these before they were gone! I love the color and how the glass doors of the cabinets mimic the glass on headboard. They provide so much more storage for us and are much better scaled for the room. 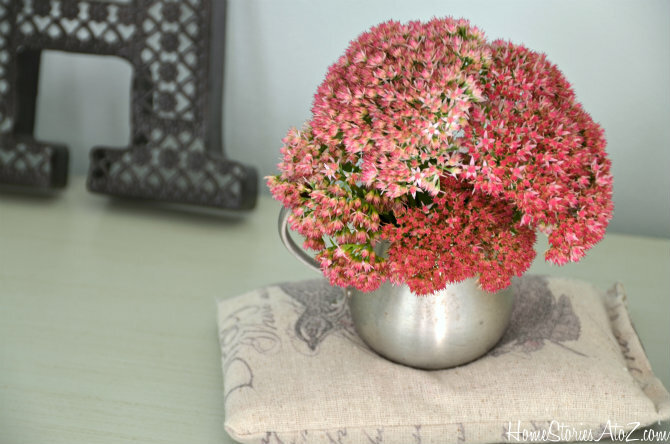 I picked some sedum from my garden to place on my new nightstand. It looks so pretty! My bedding has been collected over time. The euro shams are from Pottery Barn (purchase on ebay), the blue and white bedding is Tommy Bahama, and the bird pillows came from a Joss & Main sale. I am so pleased with the current look of my bedroom and am thrilled to finally have a romantic space that feels “right” to me this time. Thank you so much to Kirkland’s for making my bedroom design possible! Sure! It’s Sherwin Williams Comfort Gray. I have not seen the throw but I have seen a very similar pashmina scarf at Stein Mart that would give you a similar look and bring in the extra touch of coral. Do you have a Stein Mart near you? 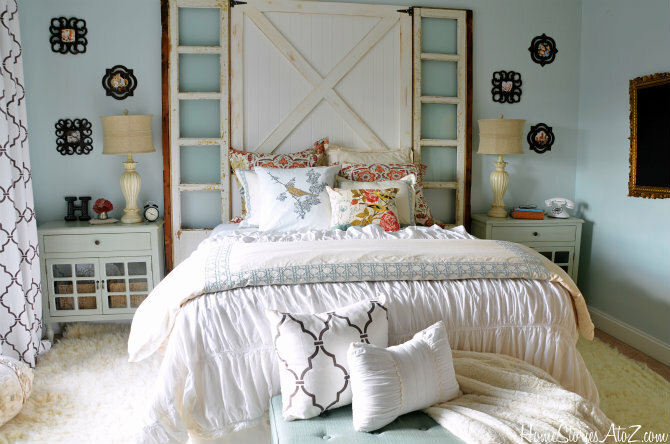 Pretty room, I like that headboard!! I love the new look of your bedroom. Everything looks so pretty! Your headboard looks even better with the fabric removed, too. (Magazine worthy for sure.) You are so creative, Beth! Where did you get your duvet (or comforter) I *love* the ruffled look! It’s absolutely warm and beautiful– I do miss your old bed. I live outside Harrisburg and the thought occurred, I wonder if she’s selling that cool bed? Thanks Elaine! I’m holding on to the bed :). I still love it too and it will probably make a reappearance at some point. I love all the changes and updates…Kirklands is one of those spots I always forget about, yet everytime I venture in, I find treasure! So beautiful! 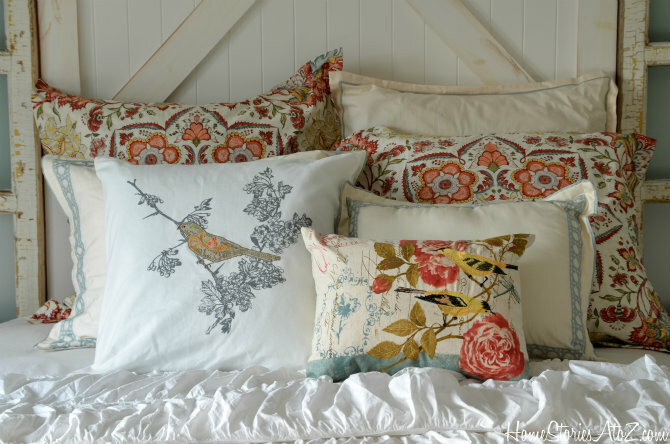 I’m crazy for those bird pillows. And I hear ‘ya on loosing track of how many times our bedrooms have been re-decorated. Beth, your new bedroom looks very cozy! I love the colours and the mix of bling and rustic. How did you do the headboard? Its Beautiful! You can get pashminas in a lot of colors.. check it out: http://www.thepashminastore.com. and that’s just one source. Good luck the room is awesome. My husband and I just bought a house in Riverside., CA and we are from Los Angeles area. It has been a bit of a struggle to find places with my taste of furniture since we are decorating our new house. I have to drive back towards our old house…IN TRAFFIC 🙁 I had never heard of Kirkland before so I went on their website to look up locations. Thanks to your post I NOW know we have one 8 1/2 miles away!!!! I am soooooooo happy to find this store and that we have one close to us even!!!! YIPEEEEE! I am heading there after I finish my lunch!!!! THANK YOU!!!!! Beautiful, beautiful!! I love the bird pillows. I am going to try and find them. Looks amazing! Where did you get those side tables?! I am in love with them!! Thanks Racheal! There is a link in the post to them but they are sadly sold out :(. They came from Kirkland’s. It’s soooooooooo beautiful! 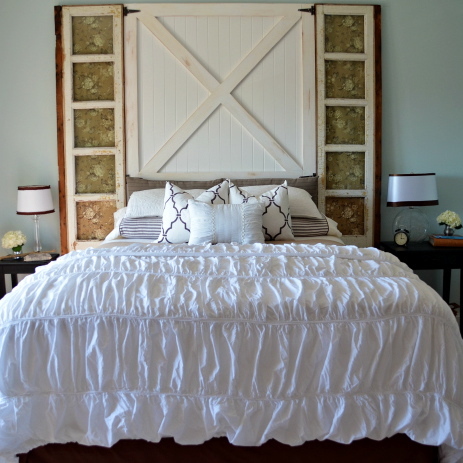 I am totally in love with your headboard and color scheme! Oooooo, I like that one Anna! Thanks girl :)! Hi Beth – I’m a 1st time visitor to your blog (via pretty handy girl) & I have to say I’m very impressed with it. OK, where to start. I love your bedroom decor. It led me to the Kirkland site, where I promptly spent $80, all seasonal decor. Love their stuff & prices. I never knew about them as there are none in Oregon (boo hoo!). If I ever get back to CA, I will check out a store though. I’m sorry they no longer have your bedside tables, l would have bought them too. That’s why I spent so much online with them, didn’t want to miss something I loved. 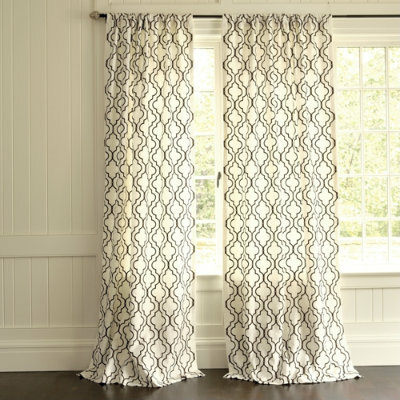 Glad you kept your stenciled curtains, I liked them better than the originals anyway. 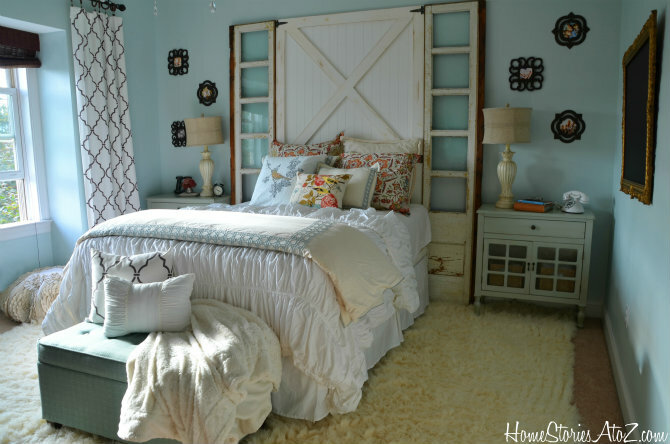 Where did you get the tall narrow glass doors you used with the headboard? They look recycled. 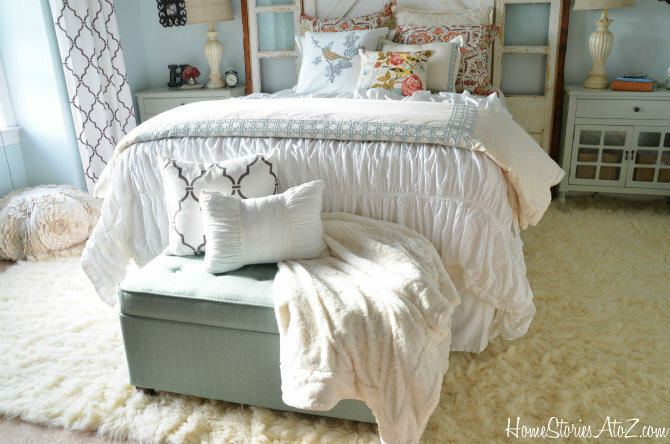 Your shirred bedspread is also beautiful, so feminine. Do you suppose something like that is still available? Thanks Louise! I’m glad Brittany sent you over :). She’s a good friend. The narrow glass doors came from our first home and are over 100 yrs. old. We built them into our headboard because I loved them so much. My bedspread came from Anthropologie. It was a splurge but I think there are several “knock off” versions of this floating around out there. Thanks again for stopping by! Truly gorgeous! I just love it! You, as always, are amazing. Honestly, I looked all over the net for one, and kept on coming up with this same brand and throw. Finding that particular color is hard! Good luck. I had no idea that you could order from Kirkland’s online! I started shopping at Kirkland’s when I was in high school, then became a really big Kirkland’s fan college (I went to college just a few minutes from their corporate headquarters). One of my prized possessions is something I bought at Kirkland’s 28 years ago, as a matter of fact. My mom and I were shopping in the Jackson, TN store when I spotted an Enesco porcelain figurine of a bride and groom–and the bride had red hair! We bought it on the spot and used it as my wedding cake topper. That shopping trip is a sweet memory, especially since my mom died in 1999. Anyway, the Kirkland’s store here in Durham closed some time ago, and I’ve missed it. I’m really glad to know you can shop Kirkland’s online! Back to the point of your post. . . after that long ramble down Memory Lane!. . . your bedroom looks beautiful! I’ve liked it in every one of its iterations, but this one is especially lovely. And it seems appropriate that the online Coral Queen should use that color in her bedroom! 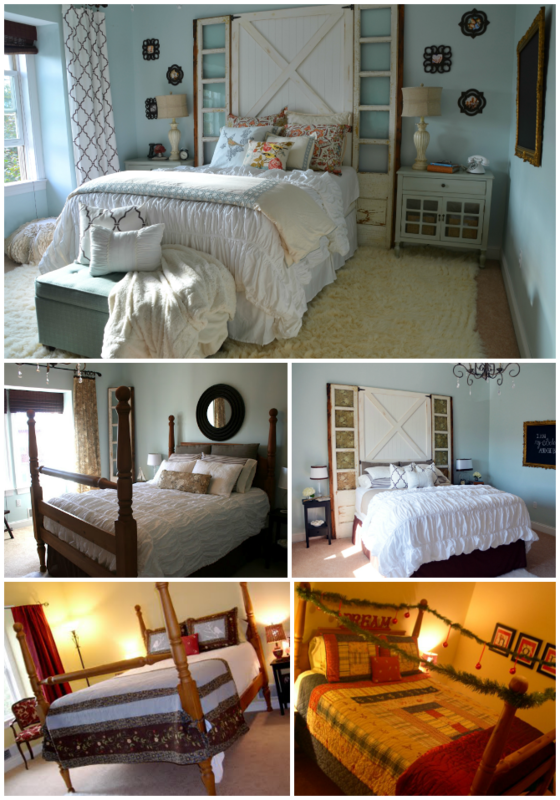 Your bedroom is so beautiful Beth! It doesn’t look very wide, maybe it’s just a pashmina they used for staging? Hmmmm, good point Jen. Maybe I need a pashmina! So pretty, comfy and cozy, Beth! I love the colors! The whole room looks so soothing! I wish we had a Kirklands near us! We don’t have any in our malls. They closed them for some reason :(. However, we have an outlet about 45 minutes away which is fabulous! I love my new rug! I bought it on a 75% off sale with free shipping from RugsUSA. It was still a splurge for me at $300 but a HUGE savings since it’s typically over $1200 at that size. I was going to ask about the rug too, it’s amazing! There used to be a Kirkland’s at Park City mall that I shopped at a lot…miss that store. Your room is so pretty and the coral is the perfect accent color! Yes, the only Kirkland’s near us now is out at the outlets. Thanks for dropping by Debra! I am pretty much in love with this room. I love the colors and the whole setting is so cozy. Great job! I love the accent colors, the coral pops so nicely against the blue walls. I also love the change up on the head board, where the wall color peeks through! This room is so inviting!!! Yes, I took the fabric down a long time ago and that helped brighten things up ;). Very pretty and some beautiful ideas. This looks fantastic Beth! I love everything about this room but my favorites are how you did the foot of the bed with the ottoman and the lamps. Oh those are so pretty. We use to have a kirland homes near us and then it closed 🙁 I love their stuff and it’s so reasonably priced. I had no idea and never thought about ordering on line from them. Cool and good to know 🙂 Nicely done! I love my storage bench too! It sort of grounds the room and makes it look more finished. Our nearest Kirkland’s is an outlet 45 minutes away. They will ship furniture to the outlets as well.